1 edition of Atene attica found in the catalog. Add another edition? Are you sure you want to remove Atene attica from your list? 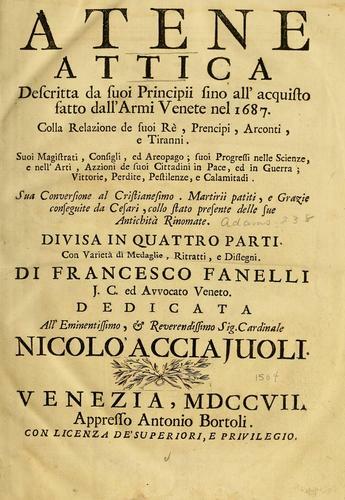 Published 1707 by Appresso A. Bortoli in Venezia . 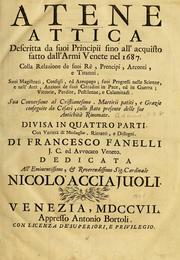 Engraved frontispiece on verso facing t.p. John Adams Library copy contains ms. note on second leaf: "See Jn Le Roys Antiquitys of Athens a... character[?] of this book / See also Walpoles Anecdotes of Painting[?] vol. 2 p. 139 Query if same[?] Fanelli." Pp. [60, 160, 167, 168, 169, 170] misnumbered 58, 148, 169, 170, 167, 168, respectively. Also available on microfiche. Cambridge, England : Chadwyck-Healey, 1989-. 8 microfiche : positive. (Cicognara library).